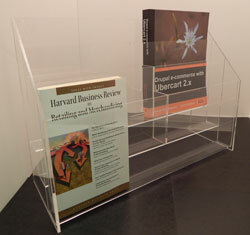 This triple wide, 3 tiered acrylic brochure holder features 9 display pockets. It is constructed to be wall mounted or can stand freely on your display counter or desk. Choose from the brochure size options below. Tiered design allows you to easily view the items on display. 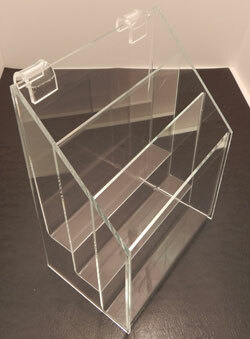 Clear acrylic construction is highly durable. This is a reliable series, 4 foot, extra vision, glass display case, with mirror doors. Aluminum frame adds stability. Tempered glass allows customers to easily view items.